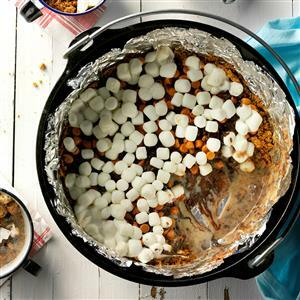 Mom’s easy Dutch oven version of the popular camp out treat is so good and gooey. The hardest part is waiting for this to cool so you can devour it. Note: I make this on my gas grill. Just set the dutch oven on the grill, close the lid and in 15 minutes it is ready. Prepare grill or campfire for low heat, using 16-18 charcoal briquettes or large wood chips. Line a Dutch oven with heavy-duty aluminum foil. Combine cracker crumbs and butter; press onto the bottom of the pan. Pour milk over crust and sprinkle with chocolate and butterscotch chips. Top with marshmallows. Cover Dutch oven. When briquettes or wood chips are covered with white ash, place Dutch oven directly on top of six of them. Using long-handled tongs, place remaining briquettes on pan cover. Cook for 15 minutes or until chips are melted. To check for doneness, use the tongs to carefully lift the cover. Yield: 12 servings.